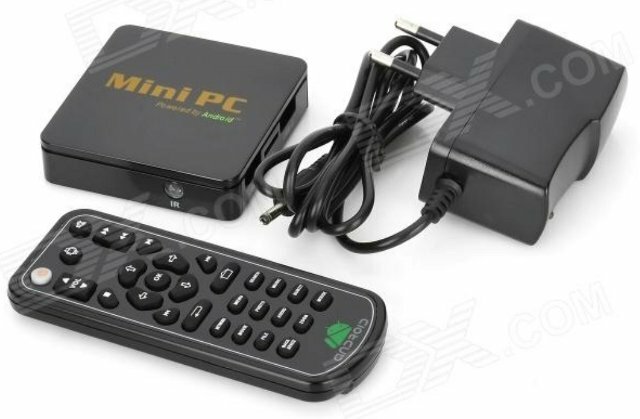 This Android 4.0 media player ships with an IR remote control, a 100~220V power supply, and a user’s manual in English and Chinese. This type of box is mainly interesting to potentially run XBMC natively in Linux [Update: There’s now a (preliminary?) XBMC Linux ROM for the Mygica A11] or with proper XBMC UI integration in Android (i.e. not via external player), since you’ll soon (February) be able to get a Rockchip RK3066 set-top box for the same price. Nice find, I will have a look. Thanks I did not know that one. i tried to change the Uboot settings of this device to boot from sdcard. I found the TX and RX pins. Is this because the uImage is to big? I know the 82000000 is the part where it writes the kernel to in memory. But I don’t find a explanation how You get to this value. On every tutorial it’s differen, mostly starting with 0x. I assume that writing 0x is the same as writing nothing (as in the tutorial from amlogic) and it only means starting from 0 to the value that follows? Or ther some uboot experts or amlogic experts that can help me with this or send me a link with a easy to follow tutorial. I googled for it but don’t get decent results, but it could be it due to my search words. Another thing. I think I made the big mistake to not check the original environment settings to boot from nand. I thought when it couldn’t boot from sd, it would boot back from nand, but that is not the case. Is there a way to determine the boot settings from nand?